Thank you to everyone who joined us for the 2018 event. The next event will be Monday, September 2, 2019. Please come and bring the family. More special details are planned for this day. The Albion Health Care Alliance invites the community out on every Labor Day, to walk the trail. The event takes place at 10:00 a.m. Participants are asked to meet at the beginning of the trail, just off Hannah Street in Victory Park, close to Victory for Kids playground area. We will walk over the footbridge that crosses a segment of the Kalamazoo River, and so we can call this a Labor Day bridge walk. Everyone is welcome to attend and walk: families, Albion College faculty, staff, and students, youth and those young in heart from the community and surrounding areas. It is a fun event that celebrates the walking trail and the end of summer. The Albion River Trail is approximately 1.6 miles long. There will be restrooms open along this part of the walk. One can walk the length in one direction, and then return by the same route, (about 3.2 miles) or choose another one to your own liking; walking at your own pace. Some of our walkers choose to park a car at the end and carpool back, others park just on the other side of the bridge for a mini walk and photo opportunity. There is also a new extension of the trail as well that continues south of Albion for close to a mile and ends up at Riverside Cemetery. Some walkers choose to keep going on this trail extension. The photo above shows the 2018 Labor Day Albion Walk the Trail group photo. As seen from photos from 2017 and 2016, the event has been growing each year. Thanks in part to the work by Albion Health Care Alliance to increase visibility of the Labor Day Albion Walk the Trail event, Albion is now a "Trail Town." This North Country Trail Association designation recognizes Albion’s advanced efforts to embrace trails and serve trail users. The Albion River Trail became part of the North Country National Scenic Trail in 2012. Come out and join in the fun to walk the trail. Bring an umbrella in case of rain. ​Below is a map of the Albion River Trail. We start in Victory Park on the lower right of this map and walk to Harris Field on the upper left (about 1.6 miles one way.) 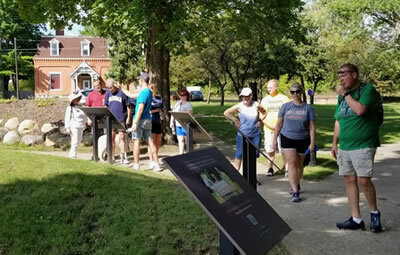 This is a great time to visit History Hill in Holland Park on the way back to Victory Park, just walk east on Cass St and it will be on the way back. Those who want a shorter walk can park in Harris Park at 9:45 a.m. or earlier and carpool back to Victory Park. Those who just want to "Walk the Bridge" can park in Rieger Park or Stoffer Plaza (the Farmer's Market area) and walk that far. You can also expand the map by clicking the button on the upper right of the map to see the legend that includes more layers that can be turned on to show Historical Markers, and Public Art nearby. Public bathrooms will be open this day at the Victory Park Bandshell, Harris Field and Holland Park. The Labor Day Albion Walk the Trail 2017 group photo is below. This was the 2016 walk that was more pet friendly, and the 2017 River Trail Walk photo shows more of the handicap access.